The view from the Hotel Antica Locanda Sturion in Venice. Venice is a monstrously expensive city—captive audience, see—and you pay a premium just to spend the night in town, listening to the canal water slap against the marble facades of Gothic palazzi outside your hotel room. Keep in mind one thing: Prices for lodgings in Venice are high to begin with, can double in summer, and triple during Carnevale. Annoying? Yes. Frustrating? Yes. Worth it to sleep in La Serenissima? Boy, howdy, yes. Don't worry. It's just a matter of knowing where to look to find wonderful hotels and other places to stay in every price range—even a room overlooking the Grand Canal for less than $200 (at the Hotel Galleria), or one overlooking Piazza San Marco where the rates start at €99 (the Relais Piazza San Marco). Booking engines have hotels in all price ranges (plus B&Bs and apartments), plus user reviews, loads of photos, and often lower prices than the hotel itself charges. Any hotels with an address in "Venezia-Mestre" is actually in the dull, modern, industrial suburb at the mainland end of the bridge over to the real, ancient Venice you came all this way to see. Do not stay in Mestre! You'll spend more time and money commuting each day in an out of Venice proper than you will save. No matter what kind of lodging you pick, if it's summer (a) try to get a room with air-conditioning and (b) even if you can't (or you can but have a hankering for some fresh air) resist the urge to open the windows to your room. 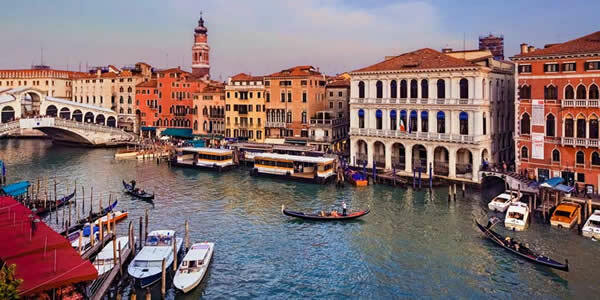 The Venice hotel tax: As of 2011, Venice began charging a Visitor Tax. This is the city's doing, and it is not a scam (just annoying). All charges are per person, per night, for all guests over the age of 10, and the tax is charged for stays of up to 10 days. The breakdown is insanely complicated, but general you pay €1 per person per night per star rating. So a couple (2 people) staying three nights (2 x 3 = 6) in a four-star hotel (6 x €4 = €24) would pay an extra €24. Non-hotels cost a bit less: €3 flat for B&Bs; €1.50–€2.50 for most apartments and residences, etc. Dec-Jan, you get a 30% discount across the board. Kids aged 10-16 pay half. Stays at hotels on the outer islands or mainland are a bit cheaper. Some hotels have folded the fee into their quoted rates; others tack it on when you check out. Just be prepared. Venice is way more popular than the number of beds it has, so while in the dead of winter you can often show up and find a good place to crash easily, the best rooms (and the best-value hotels) are booked well in advance for the summer months and the two weeks prior to Ash Wednesday (when Venice breaks out the fancy dress and masks for its famed Carnevale celebrations).